We're not fooling around this time, Tastees. Here at SD, we take our poetry seriously and we also give it seriously as noted yesterday by Sweetcakes. In addtion to our usual activities, I am committing to my annual link with Robert Brewer's Poetic Asides feature for April, where he posts a poetry prompt each day that is to result by month's end, of course, in thirty poems. Last year, I tried it with a little twist: I opted for a stanza-a-day as the lovely and amazing Adrienne Rich had died and I thought she deserved at least a thirty stanza elegy. I was happy with the system as it afforded me a realisitic challenge and a great way to tackle a larger single project. 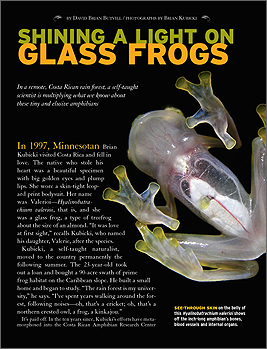 This year, I turn my sights to the glass frog and I will be using glass frog as image and metaphor for thirty different takes on the prompts over at Brewer's site. Today's prompt had to do with new arrivals, appropros of Spring, I think, as every time I look outside another brave green thing has revealed itself. a green leaf a vanishing act.